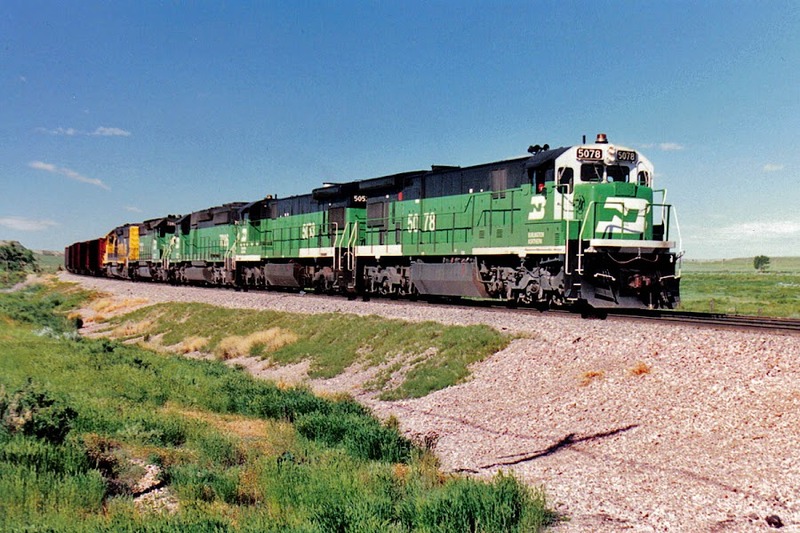 C&NW GP9R's 4529 and 4531 at Rapid City, South Dakota, around 11th June 1990, adjacent to the C&NW motive power facility. These closely numbered locomotives had a similar history. 4529 was delivered in January 1959 as GP9 number 1760, builder's number 25050, rebuilt as GP9R at Oelwein, with chopped nose hood, in September 1978 and retired by C&NW on 17th January 1991. After wreck damage, 4529 acquired the EMD hood from rebuilt Baldwin AS-616M 1560, previously scrapped at Oelwein. Sold to VMV Enterprises, Paducah, Kentucky in February 1991. Now United States Army USAX 4612. 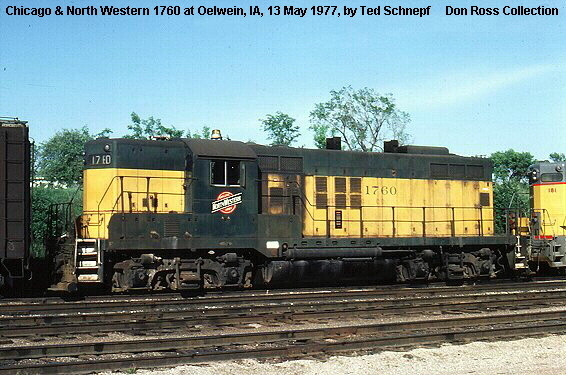 4531 was delivered in August 1959 as number 1773, builder's number 25466, rebuilt at Oelwein with chopped nose hood in September 1978 and retired by C&NW on 17th January 1991, also sold to VMV in February 1991, becoming United States Army USAX 4611. When built, parts were re-used from wrecked F7A 4093C, of April 1950, retired April 1959, which would likely include the Blomberg trucks. 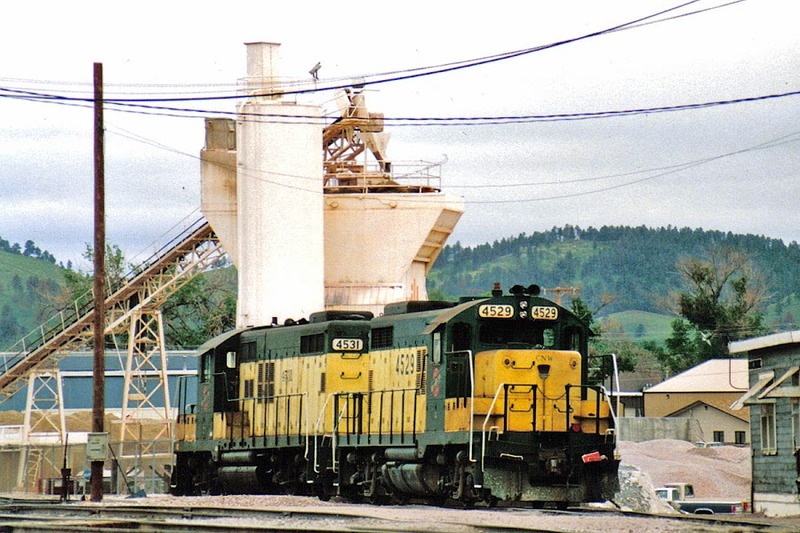 While C&NW had sold the route from Rapid City to Winona to DME in 1986, it retained trackage from Crawford, Nebraska through Rapid City to Colony, Wyoming, with the major traffic being bentonite. There was a game play where C&NW was seeking to expand in the Wyoming coal traffic, where they already had interests in the state spanning as far west as Casper. Upon acquisition of C&NW by UP in 1995, there was further focus on coal, and the Colony Line was sold to DME, which was in turn acquired by Canadian Pacific in 2007. In 2014 Canadian Pacific sold the railroad west of Tracy, MN to the Rapid City, Pierre and Eastern Railroad, a Genesee & Wyoming subsidiary. Burlington Northern U30C 5382 is seen smoking its way east through Billings, Montana, on 21st June 1994. I had seen this and 5389 at Laurel a few hours earlier. By this time 5382 was amongst the last twelve U30C's in traffic with BN. Builder's number 39941, completed in September 1974 - GE's did not have a history of lasting as long in traffic as EMD units. This unit was reported retired by September 1995. It almost certainly has been scrapped soon after that period. Next numbered 5383 went into the hands of the Illinois Railway Museum. 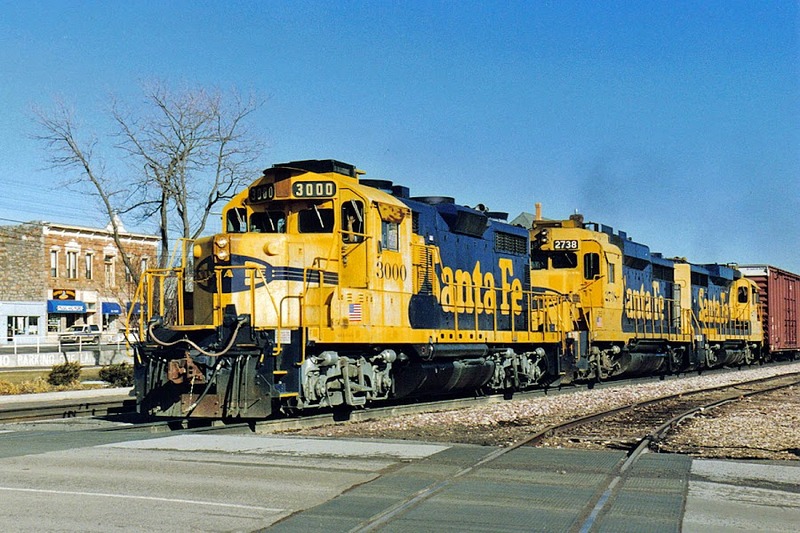 Atchison, Topeka & Santa Fe (ATSF) GP20u 3000, GP30 2738 and 2710 roll a train through Flagstaff, Arizona in early March 1993. 3000 was the first GP20 delivered to Santa Fe, as number 1100, builder's number 25573 in May 1960. Renumbered to 3100 about 1970, and rebuilt at San Bernardino, California, shops to GP20u in November 1980. Renumbered in 1999 to BNSF 2002, and now working for Pioneer Rail Equipment in Georgia & Tennessee as PREX 3000 and 2053. 2738 was a GP30 delivered to Santa Fe as 1238 in January 1963, builder's number 28061, later renumbered 3238. It was rebuilt at Cleburne, Texas to GP30u in November 1983, becoming 2738. The number was changed to 2438 under merger with BNSF, and was seen in service in 2006. In November 2012, the locomotive was sold for Larry's Truck & Electric (LTEX) and moved from California to Ohio (also here). Many locomotives are broken by LTEX, but this example was moved on to Reading Blue Mountain & Northern Railroad (RBNM) where it is GP39RN number 2531 and can sometimes be seen on tourist trains. 2710 was another GP30 deivered to Santa Fe as 1210 in May 1962, builder's number 27197, later renumbered 3210 in 1970, and rebuilt at San Bernardino to GP30u in July 1980, becoming 2710. 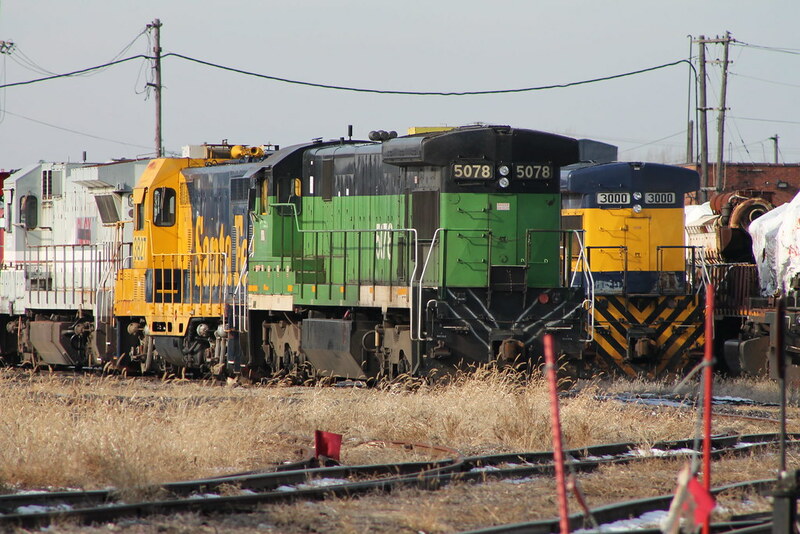 The number was changed to 2410 under merger with BNSF. In November 2011, the locomotive was sold to LTEX, seen stored in Ohio, potentially for breaking. BN C30-7s 5078 and 5053 lead SD40-2 units of BN & ATSF into Edgemont, South Dakota, with coal empties for the Wyoming coal fields, in June 1990. The 242 unit BN C30-7 fleet (5000-5141, 5500-5599) was allocated to Lincoln, Nebraska, dedicated to coal hauling and heavily utilised. 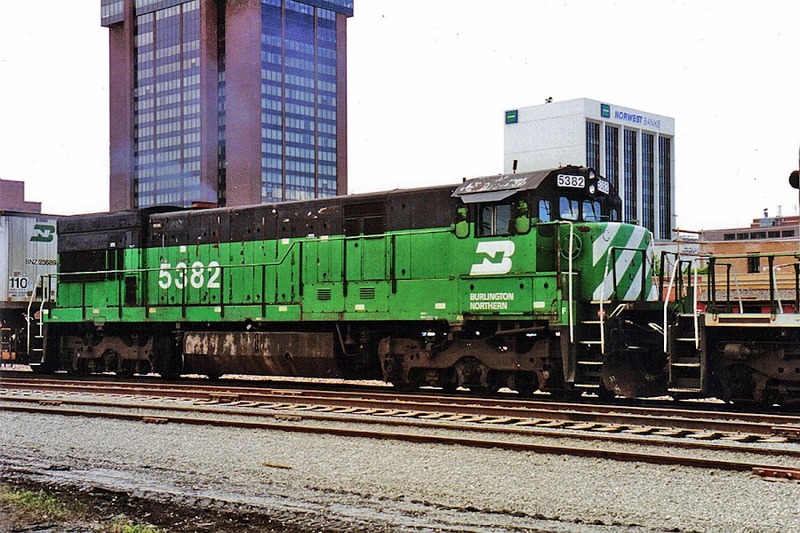 The BN "Whiteface" colours, seen here, were introduced in 1989, replacing white stripe or tiger stripe versions. 5078 was built by GE in April 1980, builder's number 42870. By late 2001 it was RMGX 5078 (Andersons Railgroup) and it was seen in storage in July 2002. A rare survivor in North America, the locomotive had a new life in Maine and Canada as MMA 5078 (Montreal, Maine & Atlantic), but then came Lake Megantec, and the locomotive was auctioned on 5th August 2014 for $80K. "The unit is in mostly good condition. The engine room was observed to be in fair condition, but overall the locomotive is in good running condition. Does need power assembly hold down bolts replaced." Moved in October 2014, by 2016 it appeared to be stored at National Railroad Equipment at Silvis, IL. - Drone flyby of Silvis in 2016 - can be seen at 2:18. A further picture. 5053 was built by GE in March 1980, builder's number 42845. This locomotive incredibly has a new life in Brazil! It is FNB or ALL 9217, re-gauged to 1.6m, which started operation there in April 2003. Further pictures. Edgemont was busy for most of the day with coal trains and empties.